While the plum's doing its best to sprinkle everything with 'snow', the living mulch is coming alive. 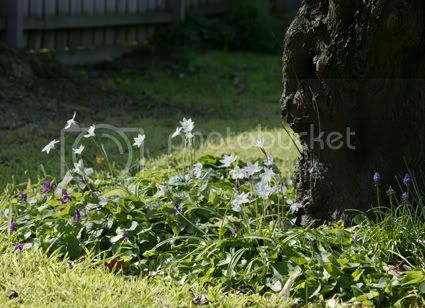 White spring stars poke through a carpet of violets. The white violets haven't even tried to flower yet! That looks pretty, Luzy. I think I see some Muscari on the right ? I keep trying to get rid of my white violets, they started off as violet ones from my sister-in-law but they all turned white, she was as baffled as myself. Bought some new plants last year and they have muliplied well and covered with violets at the moment, I live in dread that they will also turn white.